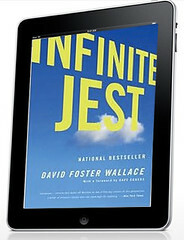 David Foster Wallace on the iPad? I’m thinking of the potential for one of my favorite books as an app, when it’s available for the iPad* (and when I actually own an iPad UPDATE 4/15: I got an iPad yesterday). I’d expect the capabilities of the device to enhance the already amazing experience I already had with the printed book, minus the few drawbacks of the medium in which I consumed it. When I read Infinite Jest, the 1,100-page book required two bookmarks to read: one for the body text and one for the 100+ pages of end notes, which actually advanced the plot and were not considered supplemental to the text. 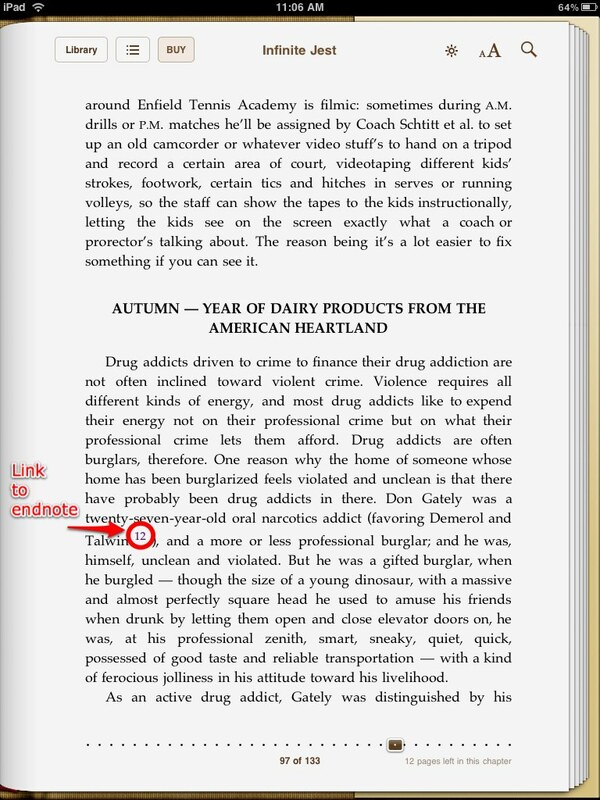 I would have loved to have a more convenient way to access these endnotes where they occurred in the main narrative, popping them open to read them and collapsing back to the main text when finished. And the end notes were in a tiny font, which I would have loved to increase to read more easily. And the book weighed more than an iPad, so reduced weight would also be a feature, not to mention an easier form factor (have you ever tried to hold open a 1,100-page book for reading over an extended period of time)? With regard to the endnotes, I could see many different ways of handling the content in ways much in the spirit of DFW’s intent. 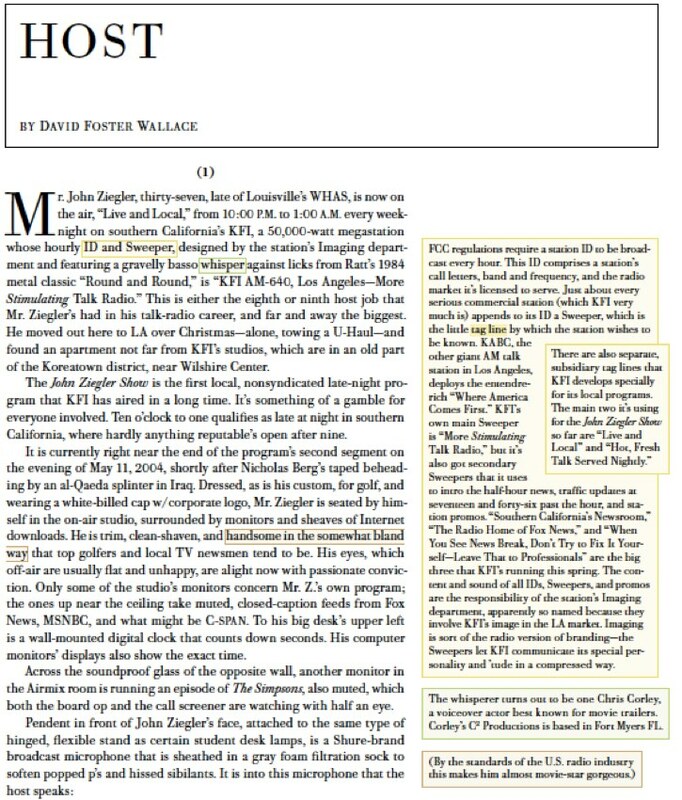 Here’s one approach that The Atlantic took for an online version “Host,” a print story by DFW that included heavy footnotes (linked as pop-ups on the page). What will it look like on the iPad? I don’t know, but I’d be willing to bet that I’d read the whole book again to find out. Does it just shoot you to a page in the back? If so, is it easy to get back to the page you were on before clicking the link? 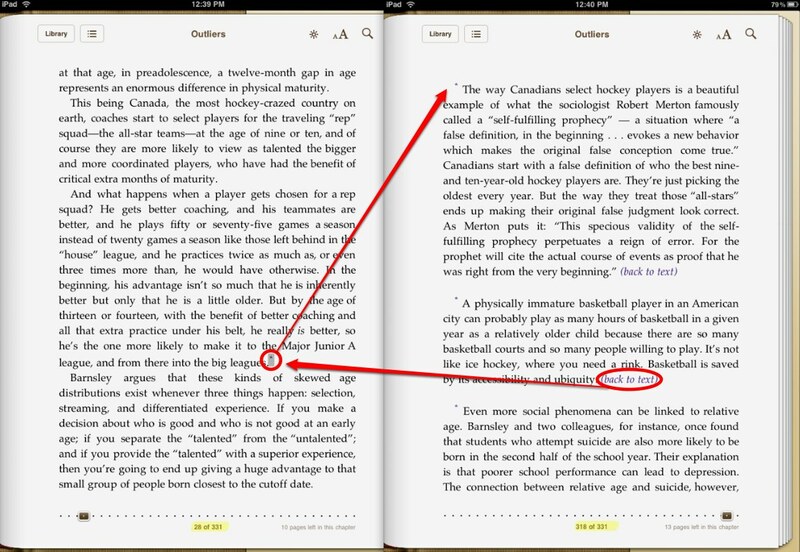 I don’t see any “Back” button in the iBooks interface. * I’m aware that it is indeed available as an iPhone app now, incorporating some of the features I’m looking for, but it also looks like the app hasn’t been optimized for the iPad yet, which means an iPhone-sized view of iPhone-sized pages, which is hardly the experience I’d pay to have on the iPad.